Early in the week, whilst shopping at Whole Foods, I had the foresight to score, amongst other things, some beautiful green beans, some new potatoes, a great big flank steak, some lamb sausages, and an intriguing little jar of Italian tuna packed in olive oil. After the flank steak was dispatched (accompanied, of course, by two of the three versions of corn fritters--but that's another story), I whipped up a black and blue salad--which was Jeff and Felix's first salad dinner of the week. 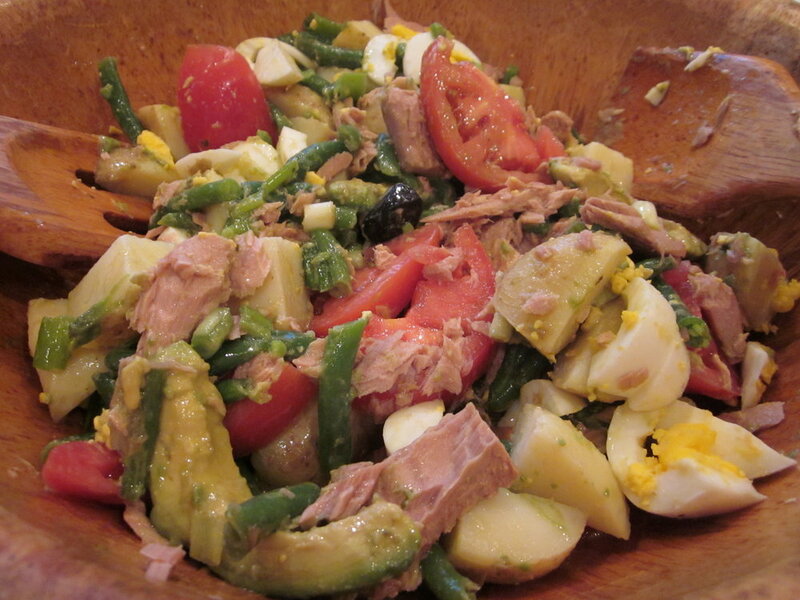 Next up was this version of Salad Nicoise which I really made on the fly. I had accompanied the lamb sausages for our Parisian guests with the new potatoes and green beans and had hidden away a couple of servings of the veggies in the recesses of the refrigerator before anyone was the wiser. The night after our guests departed, I weeded until it was almost dark and came in, filthy but content to find Jeff and Felix anxiously shuffling about the kitchen wondering, "Is she actually going to give us anything to eat before midnight?" I threw some eggs on to boil, and by the time they were done, this delicious hot- weather meal had been assembled and was being happily wolfed down in no time flat. Now, while not officially a proper Salad Nicoise, since it sported avocado which I happened to have on hand, it was close enough, and certainly rallied the troops. Things are quieter here now, and I've convinced Felix's friend Dillon to help me with the weeding. Yes indeed, things are looking up in the garden, my story is filed, the video shot, and I've happily got big plans for the weekend. I must say, however, the frantic week went just that little bit better, thanks to that magic jar of Italian tuna and a little bit of planning. Admittedly I wasn't in France, but there's no telling how high the weeds would have been had I had my Salad Nicoise in situ. And I have to say, between my lovely Parisian friends and the salad, I do feel like I snuck a little je ne sais quoi into my week. 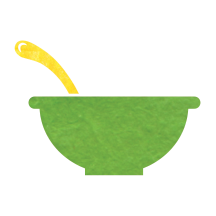 Place all ingredients on top of vinaigrette in the salad bowl. Toss well and serve immediately with fresh baguette.